There is not one ounce of my being that likes to repair furniture. But, there are two people to whom I will rarely say no, and they are my pastors. 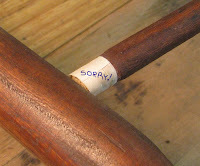 So, when our associate pastor asked if I would repair some loose rungs on her antique pew chair, of course I said yes. I had hoped to be able to knock apart the chair enough that I could fox-wedge the tenons (see illustration), but the seat is caned and I didn't want to risk damaging it. Looking for an easy solution, I posted on Facebook: Has anyone ever tried to shim loose chair tenons with tape (plus glue, of course) if you're not able to take the entire chair apart in order to fox-wedge the tenons? A slew of suggestions for fixing the joints followed: plane shavings, toothpicks, linen cloth, cotton thread, and unwaxed brown paper as shims; 1/4" lag bolt; and polyurethane glue with gap-filling properties (see blog post title). I opted for using plane shavings, which worked very well. 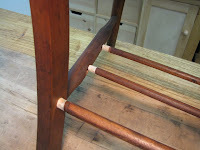 I glued and wrapped each tenon with a thin strip of wood, filled the mortise with glue (oddly, there was no old glue in the mortises that needed to be removed), knocked the chair back together, and clamped it. A few shaving fragments squeezed out of the mortises, but they were easy to pare away with a chisel. After the chair was finished, my partner, thinking she had remembered the correct joinery term that I referr ed to earlier asked, "So, did you outfox the tenon?" Only time will tell, Nancy. Only time will tell. Stephen Shepherd, who wrote The Hide Glue Book (the definitive book on hide glue), eschews the use of modern glues for many reasons, one of which is that it makes future repairs very difficult. He saw my Facebook question this morning and wrote a blog post about the evils of using modern glue to build and repair furniture. Well, I'm about to be added to Stephen's doo-doo list. Sorry, Stephen, I used Titebond III, because I do not have any hide glue and I'm lazy. I did, however, take precautionary measures before gluing up the tenons in the hopes that the person in future who will need to re-repair the same rungs won't wish that my neck be wrung. That's funny, Kari!! The ever repentant Village Carpenter. You'll notice I had nothing for your inquiry. I've never done the hide glue thing, either. It seems a rather large hassle. Perhaps, I should get Stephen's book. Love your sense of humor, Kari. I'm with Stephen on glue use and really don't understand why more people don't use hide glues. Even if you don't want to gain the virtues of hot hide glue, liquid hide glue has all the application virtues of a PVA glue and most of the advantages of hot hide glue. In my own work, the only time I don't use hide glue is when the piece is going outside and then I use Titebond III. [Expletive Deleted] How hard can it be to punch a few buttons and ordering some to have on hand. Get the liquid stuff and store it in a cool place to preserve shelf life and warm it up when needed. Don't let your mother order for you. 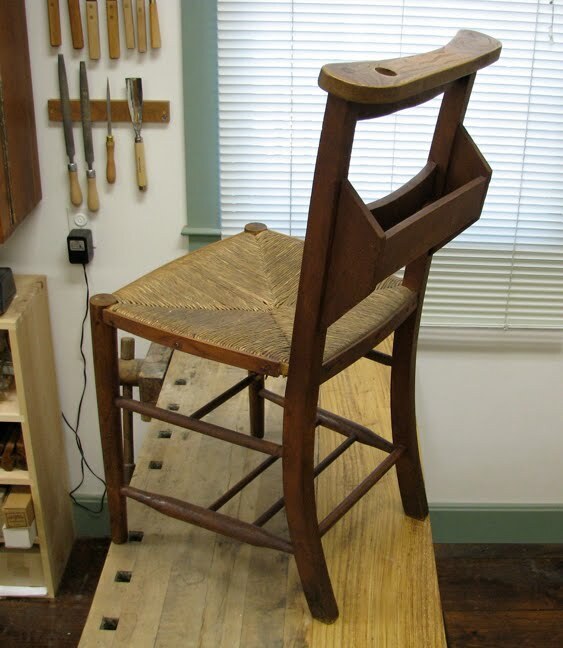 Stephen wrote "Have I mentioned that I don’t like modern glues and there is a special place in hell for those that used modern materials for repairing antique furniture?" The bad news Kari is that it sounds like you are going to hell, the good news is that you won't be alone! See you there! Sorry isn't enough. True woodworking repentance is when you turn from your old ways and become a faithful user of hide glue. There are modern glues that are reversible. Cyanoacrylate glues are reversible and in my mind are the modern alternative to hide glue (which I use in my shop). My experience with hide glue is only with hot glue and when I was using an old-fashioned double glue pot, I was not a happy camper. I then realised that in the od-fashioned joiner or cabinet-maker's shop, the glue pot was there all the time ready for use - this is really well described in The Joiner and the Cabinet-maker. So the waiting, the difficulties with small quantities, and the problems keeping the glue warm enough throughout a glue-up that I found irritating were 'modern' problems that had not been experienced by the original users of hide glue. So I sought and found a modern solution to my modern problem. It was a small electric warmer originally manufactured for use warming wax (for depilation) or sugar (for confectionary). For very few dollars (about 20) on eBay I got one of these and have never looked back in my use of hide glue. Once you have solved that problem, the rest is easy and hide glue is a delight to use. Vic, I've only used hide glue once and it was at Olde Mill, but according to Stephen's book, it doesn't seem all that difficult. Stephen, thanks for the keeping this show kid-friendly. :o) If my Mom ordered it for me, I might have it by my 70th birthday. As you saw in the video, some people were not meant to use computers. Par-tay with Mark in the naughty place! Woohoo! Luke, but if I truly repent, can I still retain my snarky-ness? I fear not. And that's not a risk I'm willing to take. Chod, I did not know that CA glue was reversible. Good to know, since I screw up so many pens. heh. Jeremy, thanks for passing along your modern hide glue tip! You can always use sachets of gelatine to make glue. Luthiers usually keep some in the travelling repair kit. Hi Kari - an elegant 'fix' for a tricky situation. Alan Peters always recommended a PVA type adhesive for chair work because of it's flexibility, but there is a lot to be said for the view that modern adhesives will make the future repair of current furniture much more awkward. On the other hand, the joints that appeared to have NO glue, probably didn't and even hide glue is an abomination there. The chair was held together by the differential shrinkage of the pieces. It stayed tight while in a non-climate controlled... climate. Check out John Alexander's books and website for info on the subject. Or Drew Langsner. Keep up the great posts as well as the awesome woodwork. Hello again Kari, I´m Julio, I was just passing by and thought to say ya. Well I´d want to comment on you tha t we both know the rising dovetail joint at last.I don´t know if You have watched my try yet, but please let me show. CA glue is reversible with heat. I use it to seat crochet needles for my wife and friends and when they need to change the length or size, I put my sodering iron on them for a few seconds and replace. Kari, I know you are catching a lot of heat for not using hide glue, pun intended, I have both a pot and liquid hide glue that I use, BUT if this is a chair in a church in a high traffic area with kids..I think you did the right thing. If this is going into a home or museum then shame on you. I think you used the right glue for the application. Out foxing the chair, LOL, sorry, well I like those also and the metal ones from Rockler work very well on more modern stuff. I'm assuming that the mortises were quite a bit too big as you had to shim the tenons. Though I'm not sure it would have worked I've used Lee Valley's Repair Glue (I think that's what the call it) with great sucess making similar repairs to my in-laws dining room set. 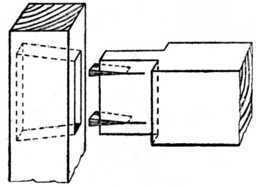 The glue is inserted with a syringe and it causes the tenon to swell, filling the mortise. The repairs are about 18 months old and endure constant abuse. So far, they're holding up well. That said, I think your method should hold up even longer as you've shimmed the tenons to fit without making them swell. Nicely done. As far as the glue, I'm no purist, Tightbond it is! Rob, fortunately, the chair belongs to my pastor. We don't use these in the church. whew! Erik, I figured they were either assembled with dry spindles and green legs or the manufacturer was just cheap. I think these chairs were made around 1900 and were made in large quantities, so I had my doubts that they were made with the dry/green technique. But I'm just guessing of course. Hi Julio, I liked your video! As soon as I saw your assembled joint, I knew what you were referring to. Roy Underhill made a rising dovetail in one of his episodes and I've always wanted to try making one. You put together a very nice tutorial. Bill, the chair belongs to my pastor and she has it in her house, so it will not see a lot of traffic. Ah well, some future Stephen Shepherd will curse me for all eternity. Alas. Dyami, the tenons were a bit tapered. I think the manufacturer just jammed them in tight. I only had to shim them with a thin piece, so they weren't all that loose. Hopefully, my fix will stick. If not, I may be cursing myself down the road when I have to re-repair it myself. I've never heard of Repair Glue. those Lee Valley people are clever folks. Heated hide glue should always be used on valuable antiques. 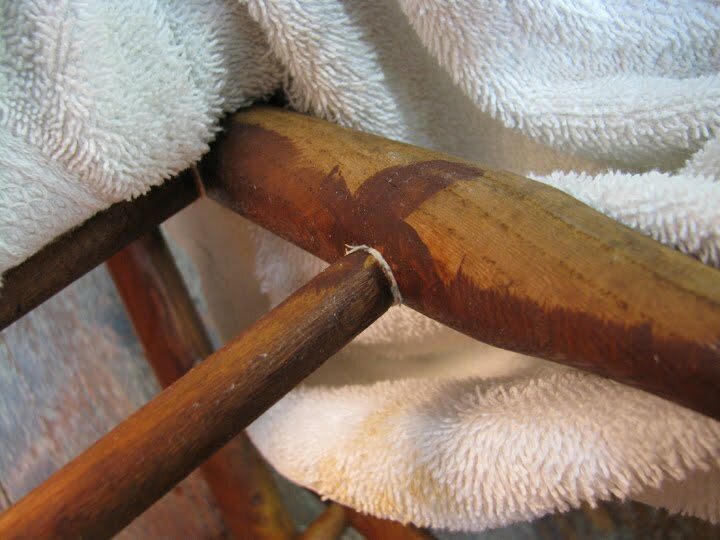 Maybe not the mass produced furniture of old, that's a judgment call - but hide glue in old joints is easy to loosen (water w/ vinegar) and when re-assembled with new hide glue, the old glue will somewhat revitalize and add to the joint's strength. The bonus - as the year's pass, the chair or other piece of furniture, can be disassembled and reassembled without damage. Modern glues, in general, are a curse when restoring antiques. Old wood will definitely break before white and yellow type glues. 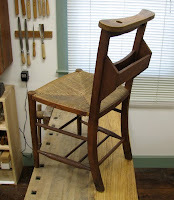 I've used your approach, shavings wrapped around tenons, with liquid hide glue to repair a number of antique chairs. Unfortunately, I didn't write "Sorry" as you did, because in a number of cases they failed in less than a year. The only real damage is to my reputation and pocket book. I can't say I have a strong opinion about glue, at this stage in my woodworking. I do love a good story and this was just that. One of the reasons that hide and other natural protein glues fail is that when the humidity goes up (barn, basement, old stone church) the bacteria gets going, and munches it up. Not too much difference between soup and glue, and bacteria are well adapted to munching up every last bit. If the joints were made dry, that is dry rods in green wood like someone mentioned, often there will be some sign of rings turned or cut into the tennon to help the mortise clamp down better. In any case, hope it works out, looks like a nice chair.